Software download automatically starts when opening either of these pages, do not be alarmed. It’s a quick download and very easy, painless installation. There are no freeloaders, no ads or popups, no search bars, nothing is installed or pushed by AnyMusic, very good!! Now installed copy of AnyMusic on your device has 14 days trial period that allows for up to 10 music downloads and 5 file conversions per day. More than enough time to fall in love with this software! =) Besides limits on valuable actions, it seems that this trial version has all the features of the full featured registered version. So we are able to check out full functionality before any commitments. This small program is reach with powerful features. 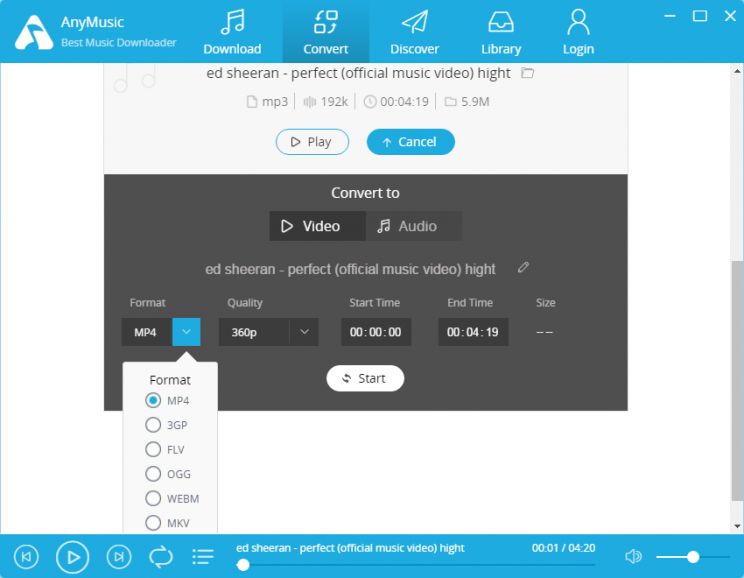 For starters, after you’ve done so many downloads and video to mp3 conversions, this program will act as your Music Library management software. With all the functions of powerful media player, it can play your music, change ID tags, add album art, etc. Built-in file converter allows you to download large 4k videos onto your home computer with much storage, enjoy them at leisure. And then convert them to mp3 and copy these songs to your phone for workout or even on the bus listening. Converted mp3s strangely end up bigger size than announced in the conversion screen though.. Here is how the program looks when first opened and a search performed for Ed Sheeran – Perfect video. Please, note, Anymusic can easily search Youtube, Archive, Jamendo and 4Shared sites for music and videos. And search results actually allow you preview the video before downloading it. Simply press Play and video will load up and start streaming. click the Download button now and dark panel with all possible download and conversion formats listed nicely and distinctively. There are all kinds of formats that youtube offers, and we’re in luck because 4k video is available here. Let’s download it! Also note that 1080p is also available. Another great tool is the built-in audio-video converter. with it you can convert your huge 4k video to 4x smaller 1080p or 6x smaller 720p after noticing that your monitor doesn’t show true Ultra HD 4k any different from the 1080p version.. Lol, just kidding. But conversion is available, it’s reach with formats and options, you can cut out piece of the video, change titles and tags, etc, etc. And it happens in the background. Very nicely implemented. Screenshot below shows possible conversion options for the “Perfect” video we’re working with. AnyMusic has even more features! Yes, there’s more to this software than you can imagine!! it works with over 1000 sources, including Youtube, Facebook, AOL, TED, etc. AnyMusic is a nice piece of software for online video searching, previewing, downloading, converting and managing your audio/video library, all in one. Very good impression, although it does need paid subscription for unlimited functionality to unveil. In my opinion, way better software than Ummy Video Downloader from savefrom, and way more functional than identical friend from flvto. What really appeals is the fact that all features are available in trial version, one can enjoy all of them from the start, and not wonder what is there more for subscription… Fast, seamless work. Good programming! 5 stars from savetube, good job!! I have a suggestion: https://mp3tomato.com/ This is a site that supports downloading music for free.